First ed. Of 500. The first 25 copies include an original drawing by Aritomo. All housed in a custom made book bound sleeve and printed inner sleeve. Look out Finland. Aritomo's fragile debut release may just out-psych the freak folk patrol, however, with subtlety. 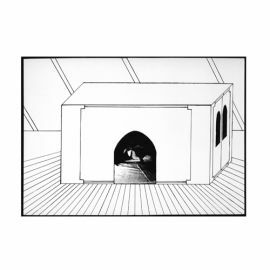 This quietly mesmerizing album was originally released in nano-quantities a couple years ago as a vinyl record, but certainly yearns to be discovered by more than a living room full of punters. There is an almost naive quality to the way Aritomo's whisper of a voice plays out against his softly lolling acoustic guitar chords. The resulting atmospheres wink at the quietudes of Nick Drake or Ryusuke Seto, though Aritomo is clearly coming from a place all his own. Simplicity is the key stone with Aritomo. His technique slithers between standard chord progressions and more organized Jandekian dissonances. Even at the most outside (which, again, presents as a subtle weirdness), the music throbs with a flickering beauty at its core. Aritomo's vocals beckon like a ghostly siren over a misty craig as his soft, trance inducing guitar echoes lure the ships in. There could hardly be lovelier rocks for a sailor to be dashed against.